Actually, there was very little snow in Reykjavik when I arrived but, in certain select places, lots of ice. More on that later. 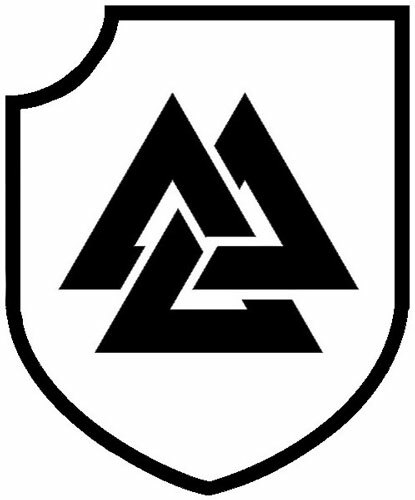 I was in Reykjavik, the capital of Iceland, to attend Operation Polar Bear, the first open tournament presented by the Einherjar Gaming Group Einherjar is a very active Flames Of War club, having play tested a number of Intelligence Briefings for Battlefront. 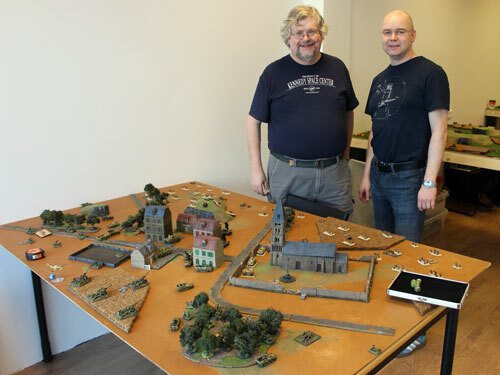 Their president and my host was Jökull Gislason, who’s designed a number of Firestorm campaigns. When Jökull first announced the tournament back in August of last year, I thought, “Wow! Now that sounds interesting!” So, I made plans accordingly. Six months later I arrived, travel weary but excited, in Keflavik Airport. The army I brought with me was my trusty Soviet Strelkovy Infantry list. I was a little worried about going through security as I was carrying the army with me as carry-on luggage. However in Toronto the only thing that happened was the exclamation from the operator of the x-ray machine that there were “Lots of little people in there!”, while in Iceland the security people handled the army with true Scandinavian sangfroid, not commenting at all. A half hour bus ride took me to my hotel next to Reykjavik Airport, built by the British after the Allies occupied Iceland in 1940. A quick nap and then it was off for lunch with Jökull. 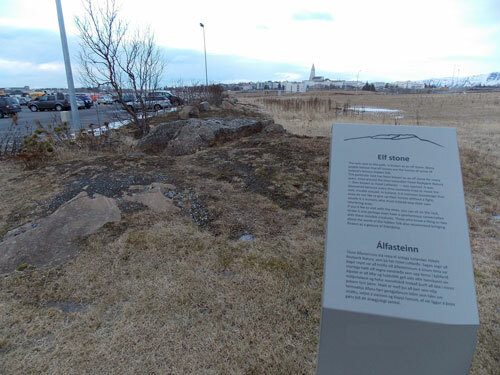 While I was waiting for Jökull to arrive, I discovered that there was an Elf Stone in front of my hotel. Bearing in mind that Elves aren’t partial to trespassers I was careful not to tread too closely when I snapped a couple of photographs. My caution seemed to have worked as nothing untoward happened during my stay. When Jökull showed up, I was surprised to learn that we had a date with a news photographer after lunch. It appeared that the press had difficulty believing that people would travel so far to play with toy soldiers. 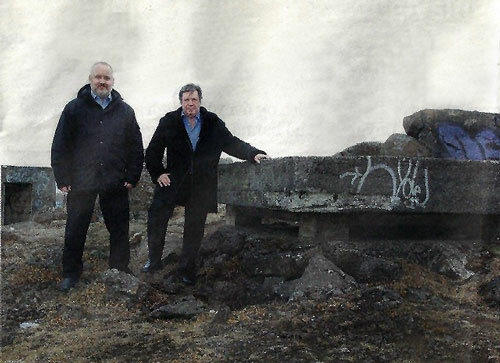 Jökull had picked the perfect spot for the shoot, an old machine gun bunker that overlooked the Reykjavik Airport. Unfortunately, the only way up to that location was along a trail that was sheer, glare, ice. It took a fair while to get where we were going, doing the old man shuffle all the while. But we got to the bunker, had the photos taken and made it back down, all in one piece. 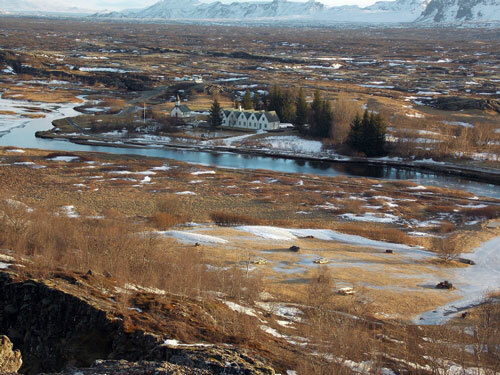 Left: With Jökull (left) next to the bunker. Our first stop was the Mid Atlantic Ridge that cuts right through Iceland. Here, where the North American and European tectonic plates meet, it was possible to be in North American one moment, and with a single step, be in Europe. So I did. Then back again. So did Jerry. By that time Jökull was convinced, if he hadn’t been before, that North Americans were all; well, somewhat silly if not downright odd. Coming back into town we stopped for lunch at the hotdog stand made famous by Bill Clinton stopping to eat there. I don’t know how Bill’s hotdog was, but mine was very tasty. Right: The Mid Atantic Ridge. Then, it was back to the hotel to rest up for Saturday and the main event – Operation Polar Bear. Everything was well organized and at 9:45 a.m., precisely on schedule, we got started. Matchups for the first game were done by lining up the Axis and Allied players facing each other. The resulting pairings were the matchups for the first game. I was opposite Óli Már Hrólfsson, who was running a Panzerjägerkompanie (Jägdpanther) list. The mission for Round One turned out to be Free-For-All, a mission I’m notoriously unlucky at. This time I decided not to be passive but to launch a simple, sledgehammer-like attack. So, while my SU-100s fenced with Óli’s Jagdpanthers I advanced my large Strelkovy Company straight at the German Objective on my right flank. Óli fired everything he had at the Strelkovy as they came in and whittled them down significantly, but there were still enough teams left to seize the objective and fend off successive German counterattacks. It ended being a hard fought 5-2 win for me against a very personable and strong player. Then it was lunch time. 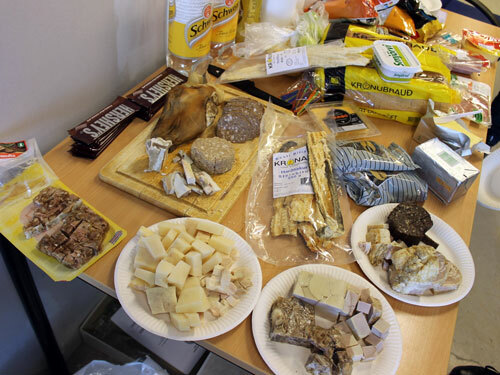 In honour of the international guests, Einherjar had brought in a selection of traditional Icelandic foods, such as soured whale blubber, cured shark meat, dried fish, lamb’s head (that’s right, a real lamb’s head), head cheese, and lamb’s testicles, as well as a selection of Icelandic beverages. I tried a bit of everything and found the taste and texture much better than I’d anticipated. The dried fish, with butter, was actually pretty good. Then it was back to the important stuff. Below: A fine selection of Icelandic cuisine. 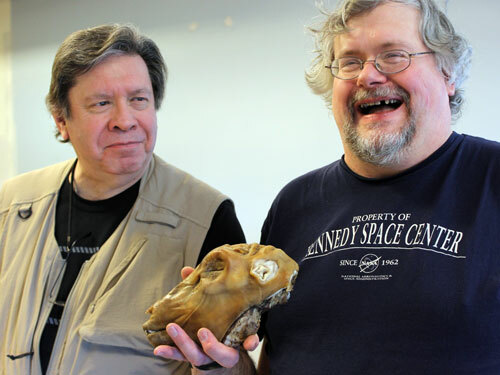 Below: Wayne, Jerry and the smoked sheep's head. 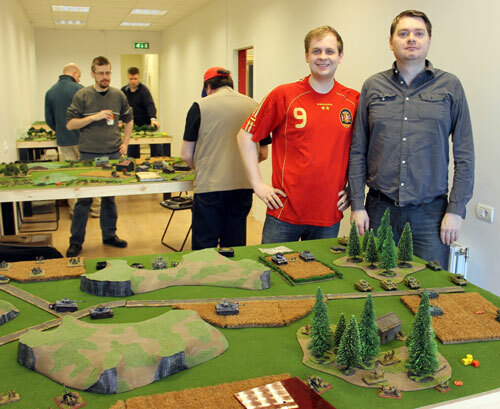 My second battle was against Andri Níelsson and his Kampfgruppe Pieper list. The mission was pincer. This battle went right down to the wire, with Andri picking off three of my nine platoons. Now I remember why I don’t like King Tigers! I had to keep on bringing my Reserves onto the field on the opposite side to where I wanted them, just to keep them safe. However, my Strelkovy clung tenaciously to their objectives until time was up. A 4-3 win for me; I’d like to thank Andri for an excellent game and for teaching me some interesting maneuvers. The last round of the day was a mobile battle – Breakthrough. This time I was against Stefán Jóhannsson’s Gepanzerte Panzergrenadiers. As he was a mechanized list I automatically became the defender. In the end, the battle became a race between my scout platoon and a German infantry platoon that came on from reserve to see who made it to the undefended objective first. My scouts squeaked in ahead of the Germans and were able to fend off their assault. The battle ended 6-1 for me but the game was a lot closer than the score indicated. Stefán put a huge amount of pressure on my troops forcing a number of morale checks. If it hadn’t been for my battalion Kommissar’s encouraging the men to hold fast it could have easily gone the other way. Saturday evening was the Einherjar Handicap, a Total War, tanks and guns only, game set in North Africa at the time of El Alamein. The table we played on was beautiful, having been constructed for an upcoming film. The detail was incredible. Below: The group in good spirits (and holding cans of Polar Bear with two Es). It was Monty vs. Rommel, with Allied players from the tournament playing the British, and the Axis players assuming the roles of the Italians and Germans. Since a team gets a point each turn for each objective controlled in Total War, it was decided that at the start of each team’s turn, that side had to drink a shot for each point they scored – so, score three points and three people on that team had to drink a shot each. Hence the handicap. The battle was hard fought, with brewed up tanks blazing everywhere. However, the Allied artillery continued to smoke the German 88s that were holding the centre, allowing Jerry Lane to break the Axis line with his Grants and Shermans. In the end, it was an Allied victory. Left: El Alamein; the Aftermath. Below: The heat of battle. Below: The Best Commander and Best Adjutant. Day Two got off to a rousing start with the first battle of the day being Surrounded. My opponent was Þórarinn Sigurðsson and his Panzer Lehr Company. Þórarinn caught my SU-122s lollygagging in some woods with one of his Grenadier Platoons and proceeded to wipe them out. Ouch. Again, my Strelkovy came to the rescue by refusing to give up the objectives. In the end it was a 5-2 win for me against a very determined and pleasant opponent. The final match of the tournament was Dust Up. I was playing against Frímann Haukdal’s Grenadiers. Frímann’s heavy artillery battery was on the table, which proved devastating for my infantry who were caught in the open while crossing a field. After failing two thirds of my infantry saves the remainder of the platoon decided to just hunker down right there for most of the game. Neither of us was able to shift the other off of our respective objectives so the game resulted in a tie in my favour, 2 to 1 as I’d been able to destroy two of his platoons and lost only one of mine. A decidedly hard fought game against a most gentlemanly player. Below: The Victors of Operation Polar Bear. That finished the tournament. In the end, I managed to tie with Rúnar Magnússon for Best Allied, while Þórarinn took Best Axis. But really, in the end it isn’t about winning or losing. It’s about remembering to have fun. After all that is the main reward for most of us. 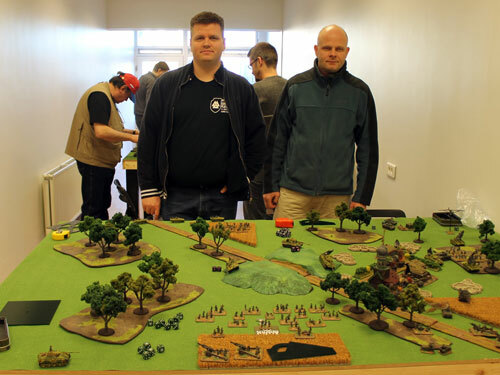 What tournaments like Operation Polar Bear offer is the chance to meet and play against new opponents, play against different armies from what you’re used to and to make a new friend or two. 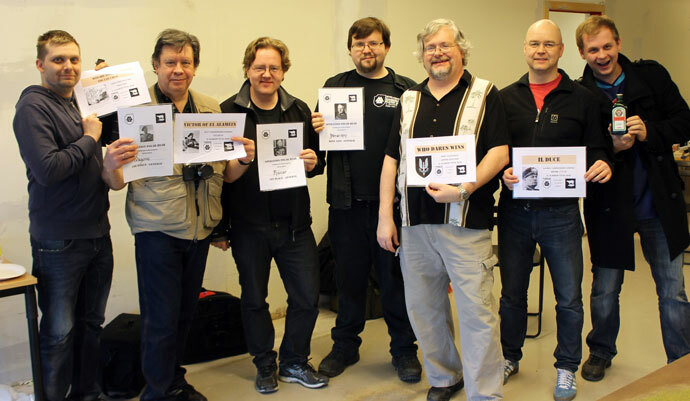 I certainly enjoyed my visit to Reykjavik and the Einherjar Gaming Group. Hopefully I’ll get invited back again. Operation Polar Bear was played strictly Axis vs. Allies. 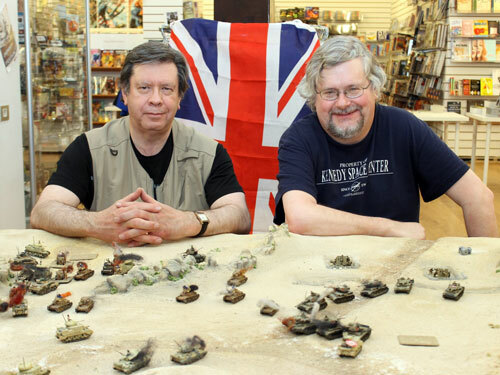 Three players volunteered to join in as Axis or Allies to even the numbers. Surprisingly all ended up in the Allied Camp. Missions played were random with no half army in delayed reserve or category mission; Fair fight, Defensive or Mobile battle played back to back. Missions played were, in order of first to last: Free-For-All, Pincer, Break Out, Surrounded and Dust Up. Both Andri and Björgvin had to miss a game and Jökull and Brjánn volunteered to miss out a game. No points were awarded for these games but technically they could have been awarded 6-1. * = Only played four battles. 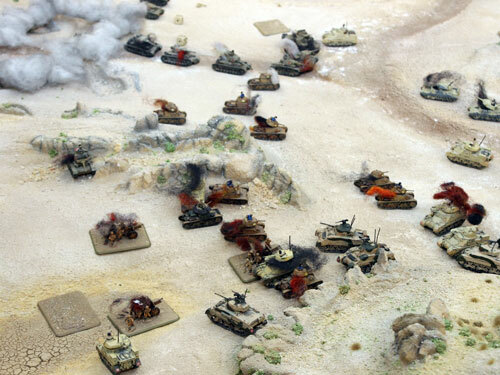 The Total War battle was based on the Charge of the 9th Brigade during the 2nd Battle of El Alamein. Einherjar have a lot of experience setting up such battles and only tanks and gun teams were allowed on the table, no infantry platoons were present. 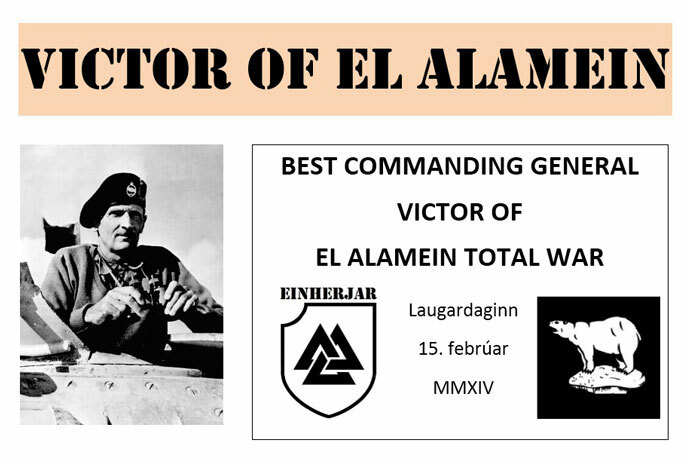 Victor of El Alamein: Wayne – a certificate and a blister with Montgomery. Wayne was chosen to lead the Allies since he was the highest ranking Allied Player after day one. Stefán set up the army on a broad front without any special focus. He further confounded his plans with a general advance sending the hapless Italian light tanks (Italian Mediums) against the main British thrust where they were quickly brewed up in what was as brave a charge as it was futile. 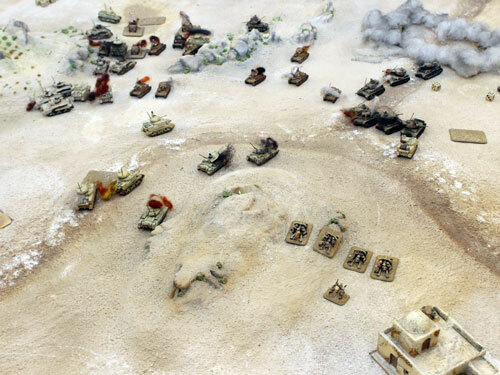 After this the Axis Army lost the initiative and was forced to move its platoons in a desperate attempt to seal the front but allowing the British tanks to fight the Axis Army piecemeal. Despite the best efforts of his subalterns who caused much damage to the Allied charge the battle was lost at his command level. Kristján had under his Command 8 Crusader tanks and was sent to threaten the left Axis flank and draw their forces there. He then proceeded in his private war against only a single platoon of three Panzers far away from the main effort and nowhere close to any objectives. After 6 turns he had lost all his Crusaders and had only been able to take out a single Panzer. 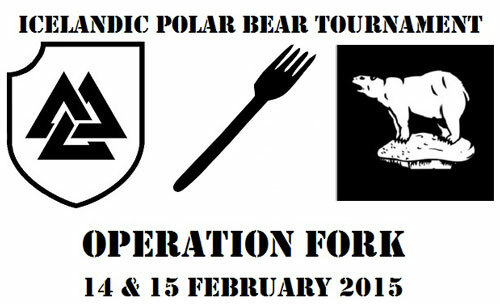 Einherjar will be hosting another open event next year; Operation Fork.